Logo images by Allemann Almquist & Jones, 2017. The Presbyterian Historical Society is pleased to announce the opening of “Presbyterians and the American Revolution,” an in-house exhibit at 425 Lombard Street in Philadelphia. The new exhibit features sixty items from the Revolutionary War, its build-up, and aftermath. Original manuscripts, rare publications, digitized images, and evocative artifacts fill the PHS lobby. A related hallway display remembers Presbyterian celebrations of the centennial and bicentennial. 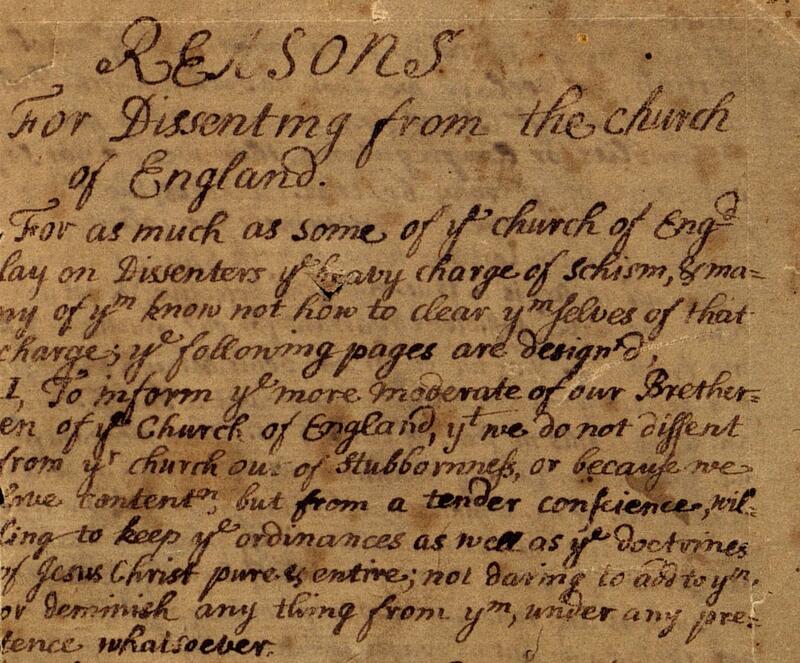 Francis Alison's handwritten sermon "Reasons for Dissenting from the Church of England," undated. As with past PHS exhibits, "Presbyterians and the American Revolution" draws heavily on the Society’s permanent collections, displaying handwritten sermons by influential ministers such as John Rodgers, George Duffield, and Francis Alison; records detailing damage to churches and the lives of worshippers; and art objects connected to celebrated Loyalist and Patriot Presbyterians, including Flora MacDonald, James Caldwell, and Azel Roe. A prominent new feature for this exhibit comes from outside PHS: loan materials from PC(USA) churches that were active during the revolution. Flora MacDonald, a Loyalist from North Carolina. Participating congregations include Brick Presbyterian Church, New York City, NY; First Presbyterian Church, Trenton, NJ; Johns Island Presbyterian Church, Johns Island, SC; Old Pine Presbyterian Church, Philadelphia, PA; Old Presbyterian Meeting House, Alexandria, VA; and Springfield Presbyterian Church, Springfield, NJ. Hearty huzzahs go to church members, pastors, and staffers who made this collaboration possible: Margaret Holben Ellis, John Russell Allen, Tina Marshall, Ronald Shaffer, Donald Dahmann, and Linda Jurczak. Ron Vinson and Katelyn Powell at the Presbyterian Heritage Center in Montreat, NC, also provided generous material support. Loaned items and PHS holdings combine to tell—and show—the broad story of Presbyterian attitudes toward the rebellion and its historical legacies. A 1789 newspaper containing published letters between the Moderator of the first PCUSA General Assembly, John Rodgers, and President George Washington complements a hand-written note from General Washington to Chaplain Rodgers from 1784. (The first four Presidents are represented in the exhibit through personal correspondence or manuscripts.) A 1767 letter from Benjamin Rush asking John Witherspoon to lead the College of New Jersey—today’s Princeton University—rests beside a 1784 Benjamin Franklin missive discouraging College of New Jersey president Witherspoon from attempting to raise funds in Europe. What's old becomes new again through such such juxtapositions. 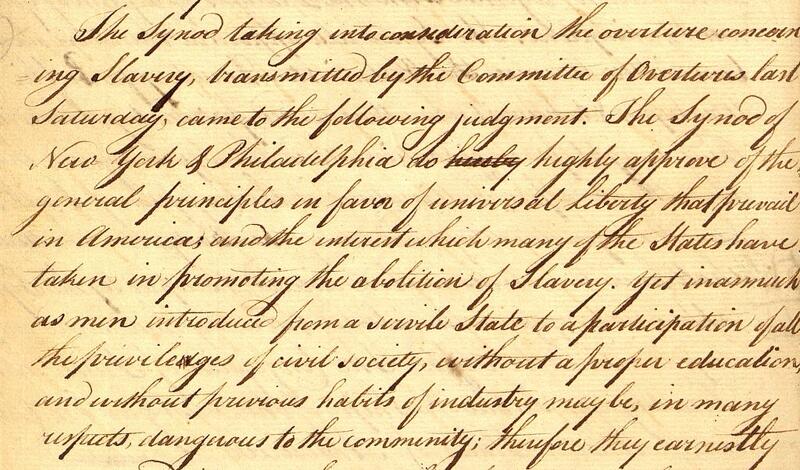 Minutes from the Synod of New York and Philadelphia approving the principle of abolition, 1787. Overview banners provide another new exhibit wrinkle, as does a new arrangement of display cases—firsts in the Society’s 50 years in Society Hill. Visitors have more space to view the exhibit’s four main sections and an improved exhibit flow. A relocated “angle” case displays items connected to Presbyterian chaplains from the revolution. Across the room, a roof shingle from the rebuilt Springfield church and a slave pew from Johns Island flank the Witherspoon grandfather clock. PHS launched the exhibit to coincide with the opening of the Museum of the American Revolution, giving church groups, Presbyterian families, and other visitors to Society Hill a chance to explore the outsized role Presbyterians played in the nation’s founding in tandem with a visit to the new museum. PHS is located seven blocks away, and only five blocks from Independence Hall—the building where the signers of the Declaration of Independence made their lasting marks in July 1776. As "Presbyterians and the American Revolution" explains, twelve of the fifty-six were Presbyterian. James Caldwell, Patriot chaplain from New Jersey. "Presbyterians and the American Revolution" will be exhibited until Winter 2018; beginning on July 4, explore the online version at www.history.pcusa.org. Church groups interested in viewing the exhibit and touring the building should contact Lorraine Brown, PHS Sr. Administrative Assistant. Researchers should contact the reference desk. The Presbyterian Historical Society is open Monday to Friday, 8:30 to 4:30. All are welcome and attendance is free. Parking is available on a limited basis.